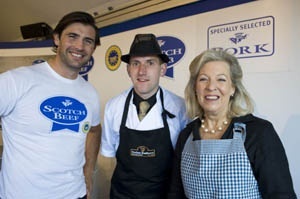 Two highly charismatic celebrity cooks caused a stir with the crowds at Quality Meat Scotland’s stand at this year’s Royal Highland Show. 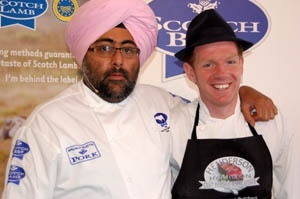 The irrepressible Lady Claire Macdonald and Hardeep Singh Kohli joined in the celebration of the launch of the 20th anniversary of the world-leading assurance schemes which underpin the Scottish red meat industry’s brands, Scotch Beef, Scotch Lamb and Specially Selected Pork. Lady Claire tempted audiences at QMS’s ringside stand on the Thursday and Friday of the show with some of her favourite beef, pork and lamb recipes. These included: Roast Ham with Rhubarb and Ginger and Pickled Shallot Sauce; Scotch Beef Fillet with Crème fraiche and Chutney Dressing and Slow Roast Shoulder of Scotch Lamb with Onions, Haricot beans, Tomatoes, Anchovies and Rosemary. Lady Claire runs the Michelin-starred Kinloch Lodge restaurant and hotel on Skye with her husband and family. Winner of this year’s NFU Scotland Ambassador Award, she proved a hit with the crowds with her passion for top Scottish ingredients and her endless energy. 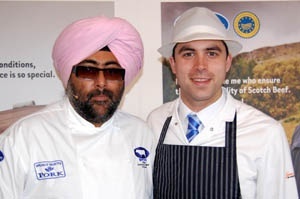 And jetting up to the Royal Highland Show from London to dazzle show-goers attending the weekend cookery demonstrations at the QMS stand was Hardeep Singh Kohli. Mr Kohli, star of numerous national TV and radio shows, proved a huge hit with the show crowds. His hilarious banter combined with his sheer love of cooking proved to be a hit again with show goers attending the free of charge sessions. 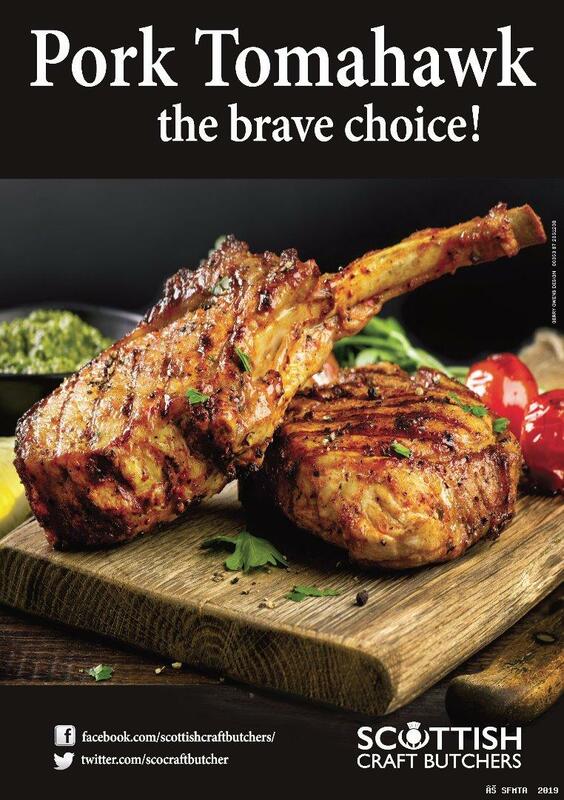 On Hardeep’s show menu was Specially Selected Pork Vindaloo; Herb Crusted Specially Selected Pork Loin with Orange Jus; Black Beer Braised Scotch Beef Flank and Punjabi Scotch Lamb Chop Curry. 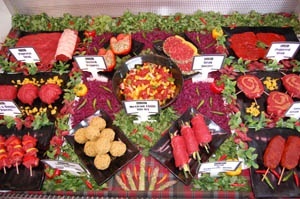 In between cookery demonstrations the QMS stand hosted butchery sessions involving some of the country’s top young butchers with commentary from Douglas Scott, Chief Executive of the Scottish Federation of Meat Traders Association. 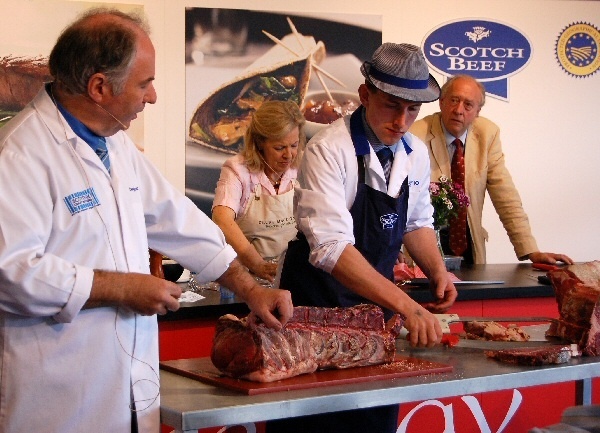 On the Thursday of the Show Scottish Young Butcher of the Year, Murray Jamieson (20) from Bruce Brymer's in Brechin cut Shoulder of Lamb and Pork Loin. On the Friday Scottish Butcher of the Year, Gary Raeburn (25) from Forbes Raeburn & Sons, Huntly cut steaks and joints from a Long Cut Sirloin. Saturday saw Steven Strachan (25) Manager of Hendersons of Hamilton demonstrate cutting a Shoulder and Leg of Lamb, and a Pork Loin. Stewart McClymont (25) Manager of Simon Howie's Auchterarder shop finished off the demonstrations on the Sunday working on a bone-in Popeseye. 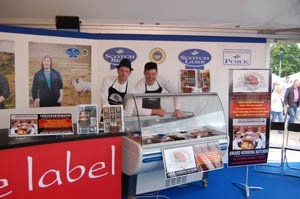 With so much going on Quality Meat Scotland’s stand at the Royal Highland Show there was a constant a buzz. School children and members of the public had the opportunity to view sheep, cattle and pigs on another area of the stand and hear about the high standards and welfare involved in their production. Board Members and Members of QMS staff were available to answer every question and ensure no-one left the stand without feeling a real sense of the pride the industry takes in being behind its labels.